Chillers are one of the largest consumers of energy in HVAC systems. 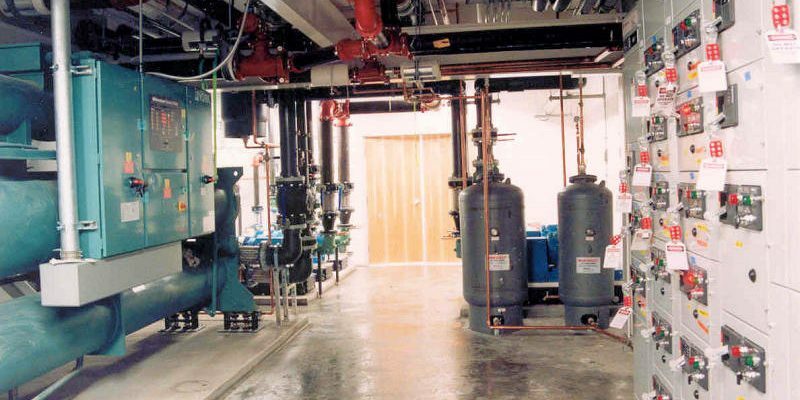 Older chillers typically utilize a single large compressor and have limited turn down. Some can unload in 4 steps, others 10, and some can only be turned down to a certain point due to limitations by the compressor or the chiller’s inability to operate stably with variable primary chilled water or condenser water flow. When the magnetic bearing variable speed compressor was developed, this paradigm shifted as chiller designs emerged having stepless capacity control, multiple, smaller compressors that allowed turndown to very low loads, and were able to handle both variable chilled water and variable condenser water flows which greatly improved chiller, as well as overall system efficiency. Having the compressor’s impeller shaft levitated within magnetic bearings also meant there were no rotating components in direct contact with each other, and oil was eliminated from the refrigerant system. Oil can foul a chiller’s heat exchanger over time and reduce efficiency. Too little oil in the chiller can lead to component failure and too much oil will further reduce efficiency. So no oil in a chiller leads to improved efficiency as well as reduced maintenance. 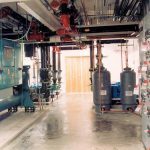 At the Space and Naval Warfare Systems Command (SPAWAR), facility personnel understood the benefits of magnetic bearing, oil free chillers and sought to install them when replacing aging chillers in their various buildings in San Diego. In a joint effort by engineering firms AECOM and A.L.M. Consulting Engineers in San Diego along with support from Vertical Systems, several water cooled and air cooled chillers have been installed in SPAWAR facilities. Two such chiller replacements occurred at buildings B40 and 580. B40 had a pair of aging 250 ton chillers and 580 a single 400 ton chiller. Building B40’s chiller CH-1 had an annual average efficiency of 2.29 kW/T while CH-2’s efficiency was 1.10 kW/T. This low efficiency resulted in an annual energy use of almost 831,000 kW. Building 580’s chiller CH-4 utilized almost 991,000 kW annually which equates to a marginally better 0.509 kW/T. As SPAWAR was looking to replace chillers in both facilities, they asked if energy could be saved in the process. Having experience with high efficiency Smardt Chillers, SPAWAR, AECOM and A.L.M. sought to use them in these two buildings where energy savings was the major focus. The chillers selected for B40 have a non-standard part load value (NPLV) of 0.370 kW/T and the chiller selected for 580 has an NPLV of 0.357 kW/T. Installing Smardt Chillers saved SPAWAR 68% in energy savings and a combined $102,000 in operating cost per year for both buildings. Reduced maintenance has also been realized by eliminating the need to manage oil in the chiller systems. No oil also means the new chillers will be just as efficient over the course of their life as they were on day one. SPAWAR, AECOM and A.L.M. have been impressed with Smardt chillers efficiency, quality construction and exceptional customer support and have used them and continue to use them whenever they have a chiller replacement. Consider a high efficiency a Smardt Chiller on your next chiller replacement project and we can help you determine how much energy, carbon footprint and money you can save.